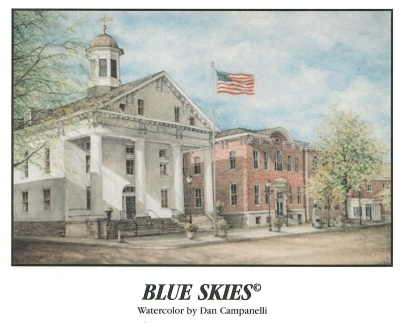 "Nothing but blue skies..." seemed to be the lyrics artist Dan Campanelli was singing to himself as he worked on this watercolor of the Hunterdon County Courthouse in Flemington, New Jersey. the weather was nice and cool early in the morning on the many summer days he and his wife sat on the sidewalk across from the imposing Greek Revival icon. Local Artist Dan Campanelli has graciously agreed to sell limited edition prints of the Historic County Courthouse via the Hunterdon Tricentennial Committee as a fundraiser for the many events planned to celebrate 300 Years of Hunterdon in 2014. ONCE SOLD OUT, PRINTS WILL NOT BE AVAILABLE AGAIN UNTIL 2114. Unframed Print Size = 20 1/4" by 28 1/2"